If you find yourself throwing away several mixing containers a year here is a technique that will save you money. 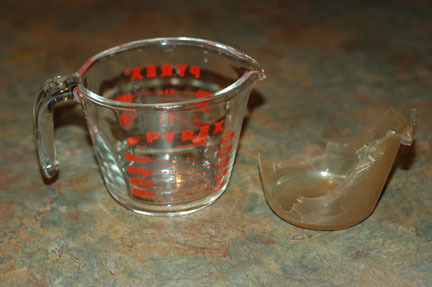 Purchase a Pyrex measuring glass. They are accurate, easy to mix in and have a secret. After you have mixed your resin in the pyrex let is set for a day to allow the resin to fully cure. Once it has cured place the glass under your focet with the hot water on high. Let it set under the running water for 2 to 3 minutes. Carefully pour the water out. You’ll notice the cured resin inside has become flexable and easily peels off the glass. Do this after every couple pours and you’ll have the best mixing bowl ever. Using hot water also removes build-up on molds too.